Every few months, ArcGIS Online is updated with new features and enhancements. Find out what’s new with the March update that educators will find useful. ArcGIS was updated this month with some exciting enhancements that include updates to the Map Viewer, Smart Mapping and Story Maps. The map viewer is the ArcGIS Online application that enables you to author and share Web maps, perform analysis and work with your layers. The following are map viewer enhancements for this release. Multilayer basemaps can now be created in the map viewer. This is useful when you have two or more layers that you want to use together as a background for other operational layers. For example, you can combine your imagery with one of the reference layers. Or can combine hillshaded terrain and other layers with a reference layer. See Create a multilayer basemap for more information. Smart mapping provides data-driven tools that enable you to explore your data to unlock patterns and relationships and easily author visually appealing Web maps. When feature layers are added, the data is analyzed and appropriate layer styling options are presented in a streamlined user experience appropriate for your data. Smart mapping harmonizes colours with basemaps to best represent your data. For this release, new smart mapping styles are added that illuminate multiple attributes in your data. Use Predominant Category and Predominant Category & Size to compare multiple attributes in a layer, and show the predominant attribute. View the Mapping Predominance story map to view examples and learn more. Smart mapping harmonizes colours with basemaps to best represent your data. For this release, new smart mapping styles are added that illuminate multiple attributes in your data. When a story map is posted via Twitter or Facebook, the post will use the title, summary and (when possible) the item thumbnail. The Web map chooser in the Story Map Builder has been enhanced so that the most recently modified maps display first. Users can manage communications from Esri through their profile page. Users will be able to sign up to receive emails about ArcGIS software, industry GIS news and customer stories. To enable these features, the account must have Esri access enabled. 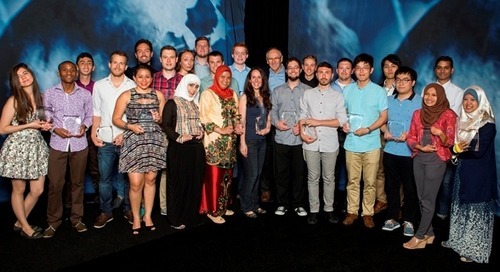 See Manage Esri communications. For more information about this release, see the What’s New help topic and related posts. 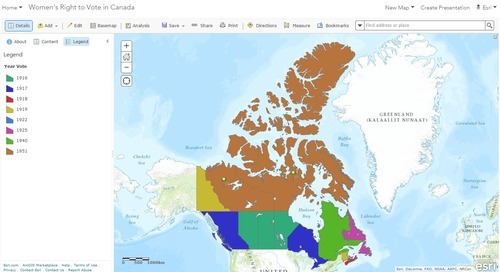 Find resources for ArcGIS Online at www.esri.ca/lessonplanner. Celebrating International Women’s Day with maps and apps!